Few weeks ago, we received a comment on our YouTube Channel from one of our viewer who asked us if we could make green leafy veg preparations on our channel. Being a winter here in India, it was a valid suggestion. In India, during winters, besides the obvious and popular dishes that are made in this season like Matar ka Nimona (Spicy Gravy prepared from Green Peas), Kachalu (Made using Potatoes), Matar ki Tahari (Rice, green peas and Lentil preparation), Urad Dal ki Khasta Kachori, Matar Pulao and not to forget Gajar Ka Halwa (Dessert prepared with Carrot) etc., some less popular dishes are also made. I am referring to green and leafy vegetables that flood the vegetable market during this season and which despite being high in nutrition are less preferred. One possible reason for this aberration could be it being low on taste quotient when compared with some of the winter recipes previously stated. Mooli is identified by several different names in the global cuisine. Known by different names Chinese radish, Asian radish, Oriental Radish, White Radish, it is more commonly identified as Daikon Radish. Daikon is made of two distinct Japanese words- Dai- Large and Kon-root, which refers to its large root appearance with its roots ranging from 2-4 inches in diameter and 6-20 inches in lengths. Daikon Radishes are one of the four main types of radishes (derived from Latin word “radix” refers to “root”), according to time of harvest-summer, fall, winter and spring. Daikon Radish or Mooli are typically harvested in winter (link ). In its base country Japan, Daikon Radish is identified as one of the most popular vegetable and is included in several recipes in many forms- raw, pickled, as sprouts and dried and simmered. In India too, we not only gave it a new name, but it features prominently in several Indian dishes- Mooli Ka soup, Mooli Ka Paratha, Mooli combined with meat (in Kashmiri preparations), Mooli Ka raita, Mooli Ki Chutney, Mooli Ka Achaar and the recipe for today’s blog- Mooli Ki Sabzi. 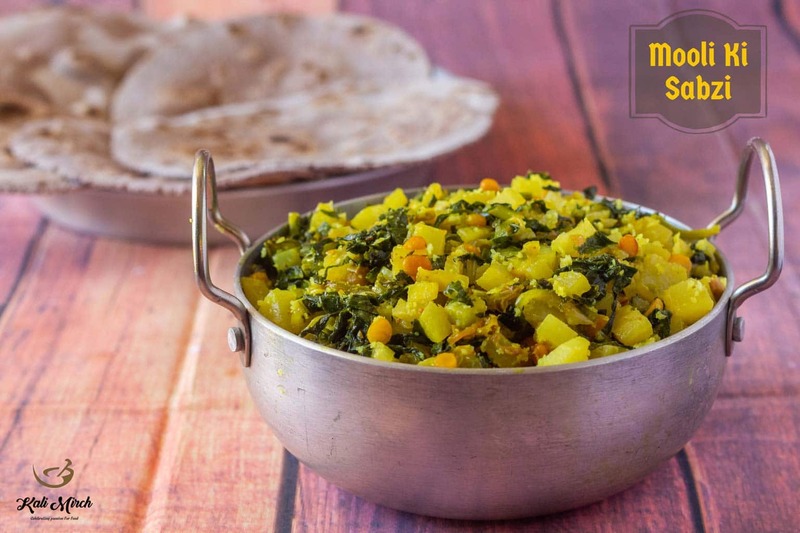 Make this simple yet delicious veg preparation that pairs up so very well with phulkas and can form your quick-fix weekend lunch. Share your feedback with us in comments section below. 4 Radishes (700 gms)-peeled and washed. We will cut each radish into small pieces so that it is easy to chop further. Chop into even sized small cubes. Ensure cubes are even-sized for more even cooking. Similarly, chop remaining radishes into cubes. Let's chop the leaves now. Form a bunch and chop finely. Let's now put the pan on heat. Heat 3-tbsp Cooking Oil in a Pan. Add chopped Garlic. Add chopped Green Chilies. Fry until Garlic turns brown in color. Now add sliced Onions and cook until it becomes soft and transparent. Cook on medium heat. Onions become soft in about 5 mins. Now, add Chana Dal. Drain the excess water. Cook Chana Dal with Onions. Cook on low heat. Add some Salt. Cook Covered. We have cooked Chana Dal for about 3 mins. It becomes slightly soft. It will get cooked completely with the vegetable. Add Turmeric Powder and cook for a min. Add chopped vegetable. Mix vegetables with all the ingredients. Cook Covered on low heat. We have cooked radish for 12 mins on low heat. It changes its color. Radish and the Chana Dal has become cooked now. Now we will add Salt to taste. Mix well. Always remember that salt must be added during last stages of cooking leafy vegetables. Add fresh grated Coconut. It imparts a sweet flavor to the dish. Remove from heat and serve hot. We have served Mooli Ki Sabzi with Nachni/Ragi Bhakri. You can also pack it in your lunch box with chapati/phulka.